For our most frequently asked questions about Dropshipping, please see our Help Centre. If you’re thinking about starting your own clothing line, fashion brand or t-shirt business then you’re more than certainly in the right place: our team isn’t just here to get you started, but to help you every step of the way towards success. And our fulfilment services aren't limited to newcomers to the industry. If you're already established, or just looking for a drop shipper to branch into the UK or European market, then Inkthre­adable's high quality and fast turnaround will help you develop your brand. 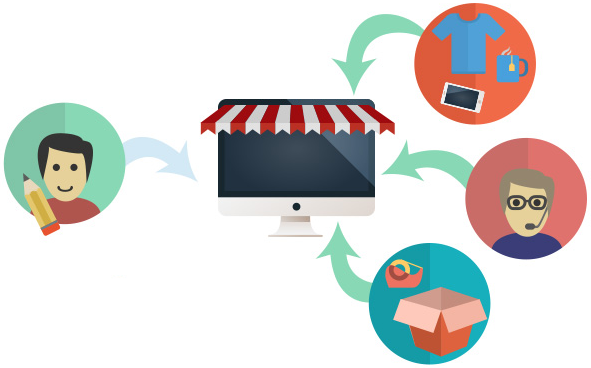 We even integrate with some of the world's most popular e-commerce platforms, like Shopify and WooCommerce,­ for automatic order fulfilment! All available products and prices can be found in our catalogue. We're very open about our pricing; the costs listed on each individul product page include the product, print & VAT. Add your shipping costs and you'll have your total cost. You'll never pay more than this. Inkthreadable don't take a cut of your profit. The Inkthreadable team’s decades of experience in the t-shirt printing industry will transform your imagination into a physical product. And we’re always following new technologies, print methods and brands to keep you, our customer, ahead of the competition. If you’re passionate about design, printed t-shirts, custom clothing and the clothing industry, and you’re ready to create a loyal brand for your customers to follow, then we're going to get along perfectly. You forward it to Inkthre­adable, either manually or through integration. We pack and ship the order straight to your customer in plain cover. We can even include your branded packing slip, free of charge. Creating a social presence on Facebook, Twitter and Instagram. Marketing your products to the customers you want to reach. Updating and optimising your store, or even integrating it with our fulfilment services. Creating new products and designs to attract new customers, or upsell to existing ones. Looking for distributors and stockists to increase brand exposure. If you're interested in our drop shipping services, want advice on starting your clothing brand, or you'd like to bulk order stock for your new or fully established business you can contact us, speak to our team on live chat (click the chat icon below) or read our FAQ.